A drunken lout left his wheelchair-bound mother with a cut head after throwing a bottle of Buckfast at her — and then threatened to set both her and his partner on fire. After spending a day drinking, John McMillan (30) turned nasty. Having already poured oil over the kitchen floor of mum Elizabeth McMillan’s groundfloor flat, he then struck her with the glass bottle and later vowed to torch the property with the pair inside. 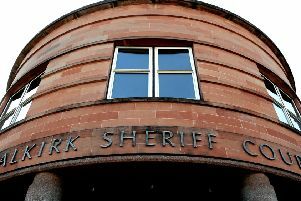 Appearing from custody at Falkirk Sheriff Court last Thursday, McMillan, 55 Wall Street, Camelon, had pled guilty to both crimes, which took place on July 30, 2016 at 119 Johnston Avenue, Stenhousemuir. He’d also admitted behaving in an abusive manner by shouting, swearing, uttering threats of violence and pursuing Anthony Tomasewski at 173 Lomond Drive, Langlees on December 26, 2016 and assaulting John McGarry by repeatedly punching him on the head to his injury in Burnbank Road, Falkirk on June 23, 2017. The court heard McMillan was already serving a 22-month jail sentence for separate offences, imposed at Stirling Sheriff Court, which were backdated to June 20 last year. Trouble flared at his mum’s home in July 2016 when he drunkenly mouthed off and became abusive towards her and his partner. Their efforts to calm McMillan down failed and he began pouring oil on the kitchen floor before storming out of the property. As his mum followed him to tell him to stay away, McMillan hurled the glass bottle, which left Ms McMillan with a cut and a lump to the side of her head. Police were called and McMillan was arrested. His defence solicitor asked Sheriff Derek Livingston to consider the fact McMillan had been in prison since June. He was sentenced to an extra three months in jail on top of his current sentence.